A lot of couples have a big time misconception about wedding planning and negotiating with wedding vendors, and I want to share some tips about how to artfully and tactfully discuss pricing with your vendors. Almost every wedding vendor I know is a small business that has a family to feed, pays taxes and works hard to make magic happen for their clients. Truthfully I don’t know many of them that enjoy being asked to lower their rates, as it devalues the hard work that they put into every event that they work on. My job as a wedding planner is not to bargain with vendors on pricing. My job as a planner is to educate my couples on the range of costs for the wedding services they need to book, and to help them find vendors that fall within their price point. My role is to also help with creative methods of making the most of their budget. 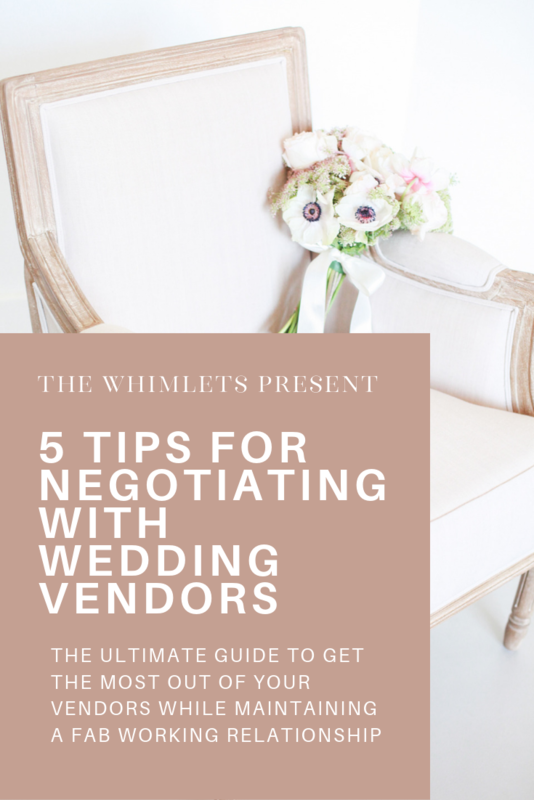 That being said, I’ve had many couples that have asked me to push for bargains and discounts, and so I’m sharing five tips for how to artfully negotiate while maintaining a great relationship with your vendors. It doesn’t make any sense to meet with a vendor who is out of your budget, no matter how much you love them. Be sure to request preliminary pricing with your vendors before meeting with them – especially for service-based businesses. While you may be willing to stretch your budget a bit for a vendor you really love, if they are thousands above your price point, it will save you both time to nix the meeting before it happens. A lot of couples are wary of this questions when vendors ask, and there is a misconception that vendors ask about budget so they can max it out. This simply isn’t true of any ethical vendor. The reason that vendors ask about budget is so they can qualify whether or not they can serve you best, and oftentimes, in the case of product-based businesses, to customize a design that suits your wedding AND your budget. Speaking of custom quotes, it’s a great idea to ask for customized packages that may suit your wedding better than the standard packages offered by a vendor. For example, if a photographer’s wedding package offers 12 hours of service, but you need 8-10, ask if there is a custom option available that suits the number of hours you need. In the example above, I mentioned asking the photographer for a custom package to suit a lower number of hours of wedding day coverage. A great approach would be to ask the photographer to throw in an engagement session, and lower the number of hours, rather than asking the photographer for discounted services. Many vendors are much more willing to offer a freebie than an outright discount to their pricing. Negotiating on points like albums for photographers, stand rentals for wedding cake vendors, a toss bouquet from a florist, or extra decor for invitation suites from a stationery vendor are a better way to enhance your existing services without devaluing the work of the vendor. I cannot stress this point enough. Many wedding vendors get multiple requests for any given wedding date, so approaching with a less-than-polite attitude may result in that vendor not even wanting to chat with you. While wedding vendors are business owners, the vast majority of them are well-intentioned people who want to show up and serve their couples well, and being rude will only result in them refusing your wedding outright. Be prepared for some vendors to be unwilling to negotiate on the pricing for their services – if you push the issue, you may damage your relationship with that vendor. Budget can be a touchy issue while wedding planning, and it can be tempting to want to push for discounts with every vendor. Bear in mind the tips above, and remember that a vendor who feels valued by their clients will likely go far above and beyond to ensure that the wedding is a smashing success, and a vendor who does not feel valued will do the bear minimum that the contract stipulates. Did we miss an important tip for negotiating with wedding vendors? Drop us a line and let us know! Whim Event Planning and Design is a team of Toronto wedding planners and day of coordinators, specializing in modern romantic weddings for fun, sweet couples who are madly in love. Get in touch with us today to start planning your dream day! Whim Event Coordination & Design was founded in 2012 by dreamers Alisha and Michelle. These creative crazies envisioned a wedding planning team for the whimsical, laid back professional couple. Alisha and Michelle believe strongly in crafting weddings that are unique to each couple’s personality, identity and love story. We are a fun and talented team of creative individuals that are driven by the love of our clients and what we do!